A diversity of dreamy experiences exists within the hundreds of islands scattered along Thailand’s Southern coast – how do you choose just one adventure to embark on? You don’t. With a convenient and rather inexpensive ferry system, today’s traveller can easily check multiple island extravaganzas off the bucket list. Known as the “land of a thousand smiles”, there is no doubt Thailand boasts some truly extraordinary experiences – both on luxurious and cultural levels – that can quite literally be consumed using all five senses. Crystal-clear blue seas and white sand shores are inevitable in Mother Nature’s artistry along every shore, and dedicated foodies will have no problem finding truly hands-on culinary experiences that extend beyond the classic Pad Thai or Green Curry. The Thai word, “Koh” directly translates to “Island”, and precedes the name of each of our recommended Thai hotspots: Ko Tao, Ko Pha Ngan and Ko Samui. Take a look at our suggestions below – this island trio is sure to satisfy all of your Thai travel aspirations, regardless of your budget! Koh Tao is an ideal first stop of the three islands in Thailand, especially if you intend on obtaining your PADI open water diving license. It is one of the world’s more affordable places to receive this internationally recognized certification, which will undoubtedly come in handy throughout your upcoming island explorations. Expect to come across multiple world-class dive sites as the islands are known to have a wide variety of marine wildlife: from manta rays to whale sharks, to vibrantly colourful fish and coral reefs. If you don’t have the time to commit to a full scuba diving certification, there is no shortage of prime snorkelling spots around the island that can be experienced either through an organized group tour or on your own. Koh Tao’s Shark Bay is accessible from the beach shore and offers clear, shallow waters for the chance to explore a variety sea life and coral formations – if you’re lucky, you might catch sight of a Blacktip Reef shark or Green sea turtle! Sleep: With warm and friendly hospitality, panoramic breakfast buffet views and the island’s most Instagram-worthy infinity pool, you can’t go wrong booking a suite at the Aminjirah Koh Tao. Devour: Sink into massive beanbags and catch happy hour cocktails at Fizz Beachlounge for an unforgettable sunset experience. Experience: With the island’s natural vibe of pure zen relaxation, yoga retreats such as those offered by Shambhala Yoga Centre can provide you with the ultimate detox to strengthen your body and mind. If you can recall anything about this lively island, it’s likely that Ko Pha Ngan is best known for its famous Full Moon Parties. Once every lunar month on Haad Rin’s crescent-shaped strip of shoreline, a low-key beach by day transitions into a once in a lifetime party that lasts until sunup. In high tourism season, the beach populates with crowds of up to 30,000 neon face-painted backpackers, enjoying mixed drinks in sand buckets and choreographed fire performances. Accommodations run anywhere from $5/night backpacker party hostels to luxury resorts on the pricier end. 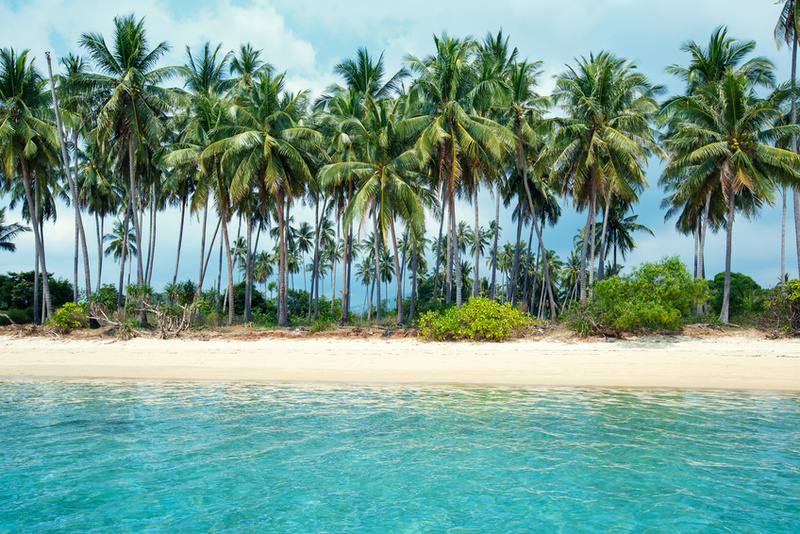 You’ll quickly discover this island has an abundance of first-class offerings –Ko Pha Ngan is not necessarily all about a constant buzz of music and expensive beach clubs. The further north, the more remote and quiet the beaches are. Here, you can escape to some of the country’s most luxurious resorts while still having access to Full Moon Party celebrations. Rest: Experience utmost bliss with your loved one at Santhiya Ko Pha Ngan Resort & Spa. A true gem to the island, the resort offers a variety of stunning private villas engulfed in lavish greenery and cascading pools – the ultimate paradise utopia in Thailand. Devour: Known for its service excellence and cultural ambiance, The Bistro at The Beach is considered to be the premier Ko Pha Ngan restaurant. Don’t miss the signature Gai Pad Med Ma Muang – a delectable stir-fried chicken dish topped with roasted cashews, chili jam and Phangan fresh pineapple. Experience: Learn how to cook like a culinary pro while crafting the perfect Thai plate – whether it be Tom Yum soup, Penang Curry, or Papaya Salad. For the ultimate foodie experience, find a class that includes a tour of the famous Thong Sala food night market. The next piece of paradise in Thailand, Ko Samui is the largest island of the three and is well-known to be suitable for all types of travellers. While it is certainly a bustling tourist hub full of stimulating experiences, Samui still offers the freedom and relaxation for those looking to do their own happy wandering. Whether you’d prefer to explore the land by foot or navigate the twisting highland roads by motorbike, expect no disappointments in this island’s magical scenery. Samui has several waterfalls, although the two Na Muang Waterfalls are the most picturesque. Tree roots form a natural staircase that lead to the base of the falls where massive purple rocks sit. Other must-see landmarks include the 12-metre tall Big Buddha Temple, locally known as Wat Phra Yai, as well as Lamai Beach, a laid-back community that sits south of Chaweng district. Sleep: If you don’t mind blowing your Baht, Ko Samui is known to have some truly luxurious accommodation retreats. Ease off in one of Code Ko Samui’s chic penthouse suites to enjoy striking views of the area’s turquoise sea. Devour: Indulge in fine Thai and European dishes at Second Nature, where East cuisine meets West. Whether you’re looking for special occasion dining or a more casual, bar lounge environment, this Lamai Beach restaurant will suit your fancy. Experience: If you’re working with a smaller budget, you’ll have no problem finding traditional Thai massage salons every few steps amongst the town with prices as little as 200฿ – or about CAD$7.50 – for a FULL body aromatherapy or reflexology foot massage! Picture this: All of the culture, cuisine and warm hospitality found in Thailand’s major mainland cities, but accompanied by endless sun-lounging, towering ocean-side cliffs and palm tree-coated shorelines. If Thailand has been forever on your to-do list, what are you waiting for? With the country’s various offerings, this island-hopping itinerary can be customized to hit all of your ultimate holiday goals. Between Koh Tao, Ko Pha Ngan and Ko Samui, the Gulf of Thailand has everything your dream vacation desires, regardless of your travelling taste.